The Kofun Period (古墳時代 Kofun jidai) refers to the protohistoric period of Japan, usually dated from 250 to ca 538 CE, characterised by the construction of large tumuli or tomb mounds (古墳 kofun). It is generally divided into two phases: early (4th century), and late 5th and 6th centuries). The Yayoi Period saw the development of a class society, incipient urbanisation, the emergence of the Yamato state, and was the era before the introduction of Buddhism to Japan. The Kofun and the subsequent Asuka periods are sometimes collectively referred to as the Yamato Period. 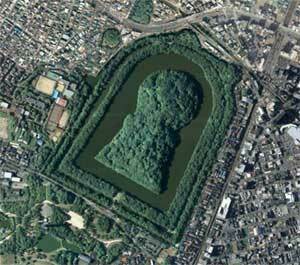 Kofun are large tombs of mounded earth built mainly for deceased members of the ruling elite during the fourth to the seventh centuries. Ranging in size from fifteen metres in diameter to 32.3 hectares in area, these tombs are the greatest single source of information on the social and political organisation and material culture of the Kofun Period. The appearance of tomb mound buildings at the end of the third century in Japan is so sudden that early archaeologists thought the tombs reflected either conquest or influence from outside the archipelago. The identity of the contributing society was sought among the tomb-building cultures of China and northern Korea, but in 1952 the Japanese archaeologist Kobayashi Yukio demonstrated that there were no similarities in mound shape of burial chamber between Japan and the continent. In the 1970s, two kinds of mounded burials from the preceding Yayoi Period were identified: a square, ditched grave (方形周溝墓 hōkei shūkōbo) found near village sites on level grounds not thought to be the prototype of the great tomb mounds, and a mounded grave (墳丘墓 funkyūbo) discovered on hilltops regarded by some to be the direct predecessor of tomb mounds. Whichever theory holds true, tomb mound-building is considered to have originated in native burial practices. The earliest tomb mounds of the Kofun period were built in the Kinai Region (畿内, Kyōto-Nara-Ōsaka). From there, tomb building spread to northern Kyushu through the Inland Sea region in the early fourth century. Early tombs had either round or keyhole-shaped mounds. Keyhole tombs may have either front-square and rear-round mounds (前方後円墳 zempō-kōen-fun) or front-square and rear-square mounds (前方後方墳 zempō-kōhō-fun). The front mounds may have originally served as a place for funerary rites; the main burial is usually in the rear mound. The first tombs were constructed on existing hilltops overlooking agricultural land. Burial facilities consisted of a wooden coffin buried directly in the summit of the mound or placed ina stone chamber of the tateana sekishitsu (竪穴式石堂, lit. vertical hole, stone chamber”) style. To construct a stone chamber, a pit was sunk into the top of the mound and lined with brick-sized stones. A floor of smooth clay was prepared for the wooden coffin. Then ceiling rocks were laid to seal the chamber; finally, the earth was mounded over the top. Clay cylinders and funeral sculptures (埴輪 haniwa) were often placed on the tomb summit over the grave. Usually, the surface of the tomb was paved with rocks. Funerary goods of the early tombs, mainly ceremonial, included iron weapons and armour, indicating that the individuals buried there bore considerable religious and military influence. Chinese-made bronze mirrors, necklaces of curved magatama and cylindrical beads made of jade and jasper, jasper ornaments and koto bridges, as well as jasper bracelets were commonly discovered. In the late fourth century, tomb building spread further into eastern and northern Japan and to the western coastal areas. 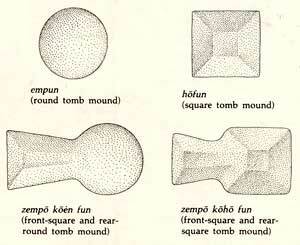 The tombs assumed a greater variety of shapes, square or gourd-shaped, formed by two round mounds joined together. Alternate burial facilities were also developed: large stone coffins were placed in the pit-style chambers or directly into the ground, and wooden coffins were embedded in prepared clay enclosures rather than stone chambers. For funerary goods, the imported bronze mirrors were joined by locally produced mirrors; there also began a trend to make jasper reproductions of functional objects such as sheathed knives, iron axe and adze heads, and to place these in the tombs instead of the originals. In the fifth century, the character of the tombs underwent drastic changes. Instead of being built on natural hillocks, they were mounded up from flatter terrace surfaces. Wide moats became a common feature, dramatically increasing the area of the tombs (e.g. the Daisen-Kofun, the tomb of Emperor Nintoku in Ōsaka, or the Ōjin Mausoleum). Accessory mounds (陪塚 baichō) often accompany the highest status tombs of this period, acting as depositories for tremendous volumes of funerary goods. Their contents attest to both the ruler's limitless access to the resources of society and to new contacts with the Korean peninsula at this time. One of the accessory tombs of the Ōjin Mausoleum, the Ariyama tomb, alone held over 3,000 iron swords and tools. Funerary goods of imported gold ear ornaments, Sue ware, and horse trappings from the continent gradually contributed to the replacement of fine jasper ornaments by coarse soapstone imitations, a decrease in the number of bronze mirrors deposited in the tombs, and the disappearance of haniwa from Kinai-region tombs. A new type of tomb chamber called yokoana-shiki-sekishitsu (横穴式石堂, lit. “horizontal hole, stone chamber”) was also transmitted from the Korean peninsula in the fifth century. Equipped with a corridor entrance, this kind of chamber was oriented so that one could walk into it, rather than only being accessible through the ceiling like the pit-style chamber. To construct a corridor-style chamber, a level surface was provided on the mound, and the stone chamber was then built up on the flat surface. The entrance to the corridor was positioned so that it opened onto the slope of the mound. Finally, the earth was piled over the chamber, embedding it in the centre of the mound, e.g. the Ishibutai Kofun (石舞台古墳) in Asuka, Nara Prefecture. The corridor allowed the tomb to be used not just once but several times, and in the late Kofun period, family tombs became quite popular. Tombs of the sixth and seventh centuries shrank in size and increased in number as they came to be used by a greater segment of the population and not just rulers. Entire hillsides were devoted to cemeteries of small, round mounds averaging 15 meters in diameter and each containing a corridor-style chamber, e.g. the Iwase Thousand-mound Tomb Cluster (岩橋千塚古墳群), the Saitobaru Kofun Cluster (西都原古墳群 Saitobaru kofun-gun) in Miyazaki Prefecture, and the Yame Tomb Cluster (八女古墳群 Yame kofun-gun) in Fukuoka Prefecture. Funerary goods of this period are increasingly utilitarian, reflecting disparities in social status or occupation of the interred. Sue and Haji ware containing food provisions for the afterlife, personal weapons and jewellery, and tools such as blacksmith’s irons, etc., were the main deposits. Regional differences in construction and decoration are the hall-marks of these latter-day tombs. In northern Kyūshū, stone figures carved of local tuff (volcanic rock) replaced many haniwa images on the mounds, while bold geometric designs and animate figures were painted on the interior walls of the chambers. The tombs of eastern Japan retained the grandeur of the fifth-century keyhole mounds of the Kinai region. The Kantō Plain housed a robust frontier society in the late Kofun period, and its warriors, thought to be under the influence of the Yamato court, were buried in style in large mounded tombs. Haniwa manufacture, dying out in the Kinai, was transplanted to the Kantō area and flourished in its new home. Haniwa images reached their peak of expression at this time, reflecting the frontier mix of lavishly ornamented horses, fully armoured warriors, stylishly attired nobles, and farmers, singers, and dancers of common origins. Funerary goods included gorgeous gilt bronze horse trappings, excellent iron weapons, and even bronze vessels from the Korean peninsula. With the introduction of Buddhism in the middle of the sixth century, an increasing number of the central elite had begun to build temples instead of tombs for posterity. Though some elaborate examples such as Ishibutai and Takamatsuzuka tomb are known from this period, imperial proscriptions governing the size and ostentatiousness of the tombs acted together with the new Buddhist attitudes, causing tomb-building to gradually cease during the seventh century. A great number of people from the late fifth to eighth centuries were interred in cave-like yoko-ana tombs in response to restrictions on space, labour, and sumptuary requirements. The Kofun Period saw the rise of the Yamato court, a chieftainship that rose to become the ruling imperial dynasty over much of Kyūshū and Honshū, as well as an increasing influx of immigrants from China and Korea, many of them forefathers of prominent Japanese clans. The introduction of Buddhism into Japan in 538 is generally considered the beginning of the next historical period, the Asuka Era.